It would be very cool to see a thread that shows the entire process of building a carbon mystic or OL. Kind of a documentary. From CAD to me running it. In this thread, there some pics of the carbon fiber being prepped for lamination. A little confusing , whether or not the Optional Construction is an addition to the standard layup with removing certain aspects of the Standard layup. "A Structural Grid" could be replacing the coring materials as with the angles of the grid would then provide the strength. Attention to detail would be in order for the layup though! Within this photo is what looks to be a laminate ready for the prepreg. Look towards the back of the table and you will see the gold color which would leave me to believe that is Kevlar. On the lower level you can see other types of glass on the rack as well. But then again, every shop should have an assortment of different types of glass for different projects. Last edited by SHARKEY-IMAGES; 01-25-2008 at 07:58 AM. Believe me, all the Race M5000 Mystics are carbon fiber hulls, If you want, call Dave Scott or JT @ TNT if you need outside verifciation as to what material Bud Select is made of. The other cloths you see on the table are for the M6000 and SL700 hulls. Even the molds are made of carbon fiber. Last edited by Dean Ferry; 01-25-2008 at 08:06 AM. If it really is 100% carbon and comes from a mound why paint it. It would look bad a$$. Tim maybe he means 100% of the boat gets a layer. Isn't it ungodly expensive? I think that the reason for painting carbon fiber products is that the epoxy resin deteriorates when exposed to uv rays. I'm sure that an expert on the subject could add more. Anyone? I'm sure that an expert on the subject could and more. Anyone? Yes, but it can be cleared with a nice finish. That sure is one sweet OL in the 1st post! Last edited by Dean Ferry; 01-25-2008 at 11:31 AM. Not that I am second guessing a company like Mystic, but if you say the boats are 100% carbon fiber, well here is some really good reading. It would make you think, "Is it really worth the trade off ?" "Do You Really Want A High Tech Carbon Fiber Boat ?" Click here for the story. Although some small parts are prepreg, Outerlimits wet lays all large-scale components. “We build quickly anyway, so prepreg does not save us time, and our facility is air-conditioned, so we already control our environment and properties.” For wet layup, Outerlimits uses two older, manual, roller-type impregnators, which have been converted for pneumatic control. “Our modifications allow us to control the wet out of the material very precisely,” he says. 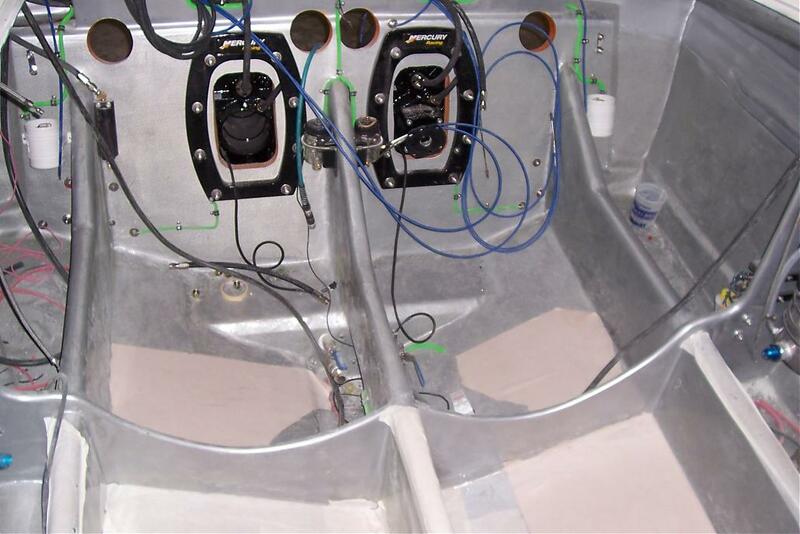 “Our component weights do not vary by more than 2 percent.” Further, resin, reinforcements and core for each component are weighed prior to construction and the finished boat is weighed, using load cells. “Our weights are so consistent that I can tell what options have been installed on a given model by how much it weighs.” Outerlimits lays up outer skins and core, then vacuum bags and cures them in its in-house-built computer-controlled oven, made using components purchased from oven supplier Watlow Electric Mfg. Co. (St. Louis, Mo.). Then the inner skin is wet layed, bagged and cured. 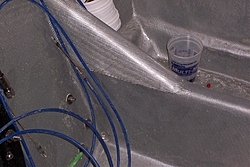 The epoxy parts reach initial cure at room temperature and then are postcured in the oven at 140°F/60°C over a 26-hour period, including an eight-hour dwell. 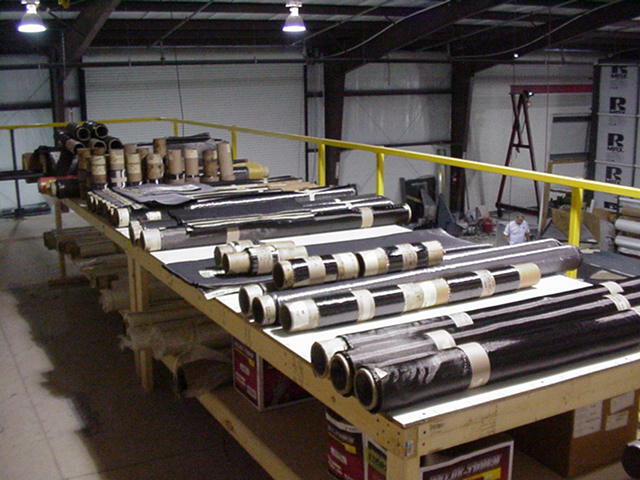 The Outerlimits staff has a long history in Nomex-cored carbon epoxy sandwich construction. 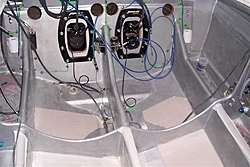 Many of its laminating crew came onboard when Outerlimits bought nearby sailboat builder and subcontractor Carroll Marine. Some of the former Carroll Marine staff worked with Gougeon Brothers (now Pro-Set Inc., Bay City, Mich.) to develop its Pro-Set epoxy resins for marine construction. Today, SP laminating epoxy (SP is the marine business division of Gurit AG, Wattwil, Switzerland) is the resin of choice. The company avoids costly, hard-to-get aircraft-grade fiber and tries to produce most parts from four basic reinforcements — unidirectional, ±45°, lightweight and heavyweight 0°/90° — to reduce inventory. Outerlimits buys from several manufacturers to ensure supply, including Gurit (Isle of Wight, U.K.), JB Martin, SEAL SpA (Legnano, Italy) and T.E.A.M. 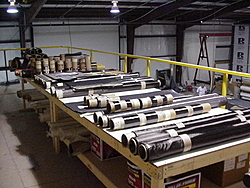 Inc. (Slatersville, R.I.), sourced through distributor Core Composites (Newport, R.I.). I highlighted reinforcements and core to show that there are other materials included in the laminate other than Carbon Fiber. But Tim Carbon is cool.